The idea of this website is to preserve for the present as well as for the future generations the image of this outstanding thinker, a scientist of a bright talent, a prominent organiser of science and a public figure. In the search for the new knowledge innovative scientists play a remarkable role. It is them who, as a rule, generate revolutionary ideas in tune with the times or often take the lead over the epoch. Academician Frolov was one of these leaders of the Soviet and Russian philosophy. He became the founder of several large trends in our philosophy. Ivan Timofeevich performed outstanding research which raised our philosophy from the state it resided in due to the well-known reasons up to the 1950-s, to its present level. This, first of all, relates to the sphere of philosophical-methodological problems of modern natural science, biology in particular. To counterbalance the Lysenko, Present, Platonov etc trend, which existed in 1940-1950-s and which has broken the traditional problems of the philosophy of science as well as the relationship between philosophers and scientists, and in a sharp fight with this trend, he created new problems of the philosophy of biology the way they exist nowadays. He did this basing himself on the overall historical-philosophical tradition of the classical philosophy and thus lead our philosophy of biology up to the world level. Frolov’s role in raising and researching such an important field as the philosophy of global problems is also tremendous. Ivan Timofeevich earlier and deeper than others in this country realised all the dangers and threats coming out of the uncontrolled scientific and technological progress. This why he was the first in the Soviet Union to be awarded the international prize “Global 500”. Finally, as a result of many years’ research in a wide spectrum of philosophical problems – from social-philosophical aspects of scientific and technological revolution with its high technologies to purely existential issues of the meaning of life, death and immortality – Frolov came to the problems of the ethics of science, humanism, the necessity of humanisation of science. His main idea became that of the central role of the complex studies of Man in the system of sciences and thus of the necessity of establishing a Center of Sciences about Man, a journal “Man”, and an Institute of Man within the Russian Academy of Sciences. He carried out these projects in the beginning of the 1990-s. The importance of Ivan Timofeevich as a person goes far beyond his scientific achievements. By his feeling of responsibility for the destiny of our philosophy, by his civic position he gained a deep respect not only in this country but also abroad. Frolov possessed an unquenchable interest for everything new and was always brave in upholding his positions. He has always believed in the future, that is why he liked the young people – this becomes obvious from his talks with the members of the Youth section of the Pugwash movement, with the youth magazine “Sobesednik”, and other materials published in this book. Two main values exist in science: one of them is the scientific truth, and the other is morals, the moral atmosphere. The latter is created by people, and a very limited number of people, nearly a handful. Ivan Timofeevich has often remembered in his works the role that some of our distinguished scientists – P.L.Kapitsa, N.N.Semenov, A.I.Berg, V.A.Engelgard, D.K.Beliaev, A.A.Baev – had played in his life, especially in a moral aspect. Not long before his death, academician Frolov speaking at the memorial conference devoted to academician A.A.Baev, said: “Some of the traits that Alexander Alexandrovich possessed are rarely found in our scientific community nowadays. The most important is that his scientific personality and his human personality existed in harmony”. In modern philosophy the moral atmosphere was created by Frolov along with such philosophers as Ilyenkov, Kopnin, Kedrov. He himself remains the important moral value for the modern philosophy. This side of his life is of ever-lasting significance. To preserve the moral essence of Ivan Timofeevich, to try and make it “visible” – this is the task which the authors of this book are trying to fulfill. L.N.Tolstoy wrote: “A man died but his attitude towards the world is still influencing people, not even the way it used to while he was alive but many times stronger, and this influence, depending on rationality and love is increasing and growing as all the living things are, never ceasing and not knowing any interruptions”. Poised on the brink of the third millennium, the world community stands at a momentous crossroad of history. Science has made extraordinary leaps forward, but what does this knowledge yield in human terms? Does it create as many dangers as it does new possibilities for improving our physical and cultural well-being? In light of this compelling dilemma, the subject of “man and science” has emerged as a dominant theme of philosophical and sociological studies, and is attracting international attention. Man, Science, and Humanismintroduces to the Western world Ivan Frolov, one of the most powerful figures in the Soviet Union. Noted for his vigorous espousal of liberal ideas, Frolov was appointed as one of three secretaries to Soviet President Mikhail Gorbachev in 1986. On the cutting edge ofglasnostand perestoika, Frolov is credited with influencing Gorbachev’s 1988 United Nations speech in which the Soviet leader claimed that universal human values transcend the ideological conflicts between East and West. Man, Science, and Humanismis Frolov’s attempt to define Marxism as a humanism, and to argue that humanism is the most appropriate philosophy for the future. Today’s culture is increasingly defined in terms of our developmental potential as human beings. With the current intricate co-dependence of nations – social, political, and economic – and the attendant mutual desire to find cooperative solutions to global problems, now more than ever, there is an urgent need for a worldwide humanism. This shared humanistic culture that emerges will be the result of a harmony and cooperation between the rational sciences and philosophy. Frolov stands opposed to all reductionist social-biological theories that interpret human culture as a product of genetic determinism. Arguing along Marxist lines, he defends the primacy of socialization, for it is through social communication that human life creates the conditions and means of individual, social, and historical development. The social mediates and transforms the biological. On this social-cultural level, humanity becomes and “end in itself”. All studies lead to human reason and intelligence as the central component of the entire system of scientific investigation, research, and development. Infused with humanism, science changes substantially in a social and human sense, in the foundation of its worldview and its value orientation. 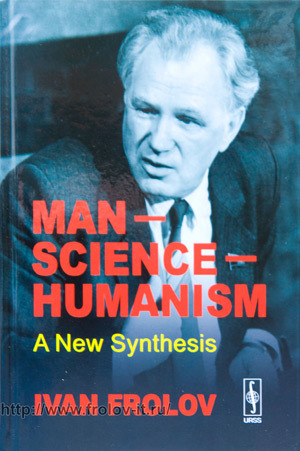 Man, Science, and Humanismoffers compelling insights into the underpinning of a new philosophical trend in the Soviet Union, a perspective that may well be the key ideological component of the immense changes occurring in the Eastern Block.